← Why is space so big and particles so small? 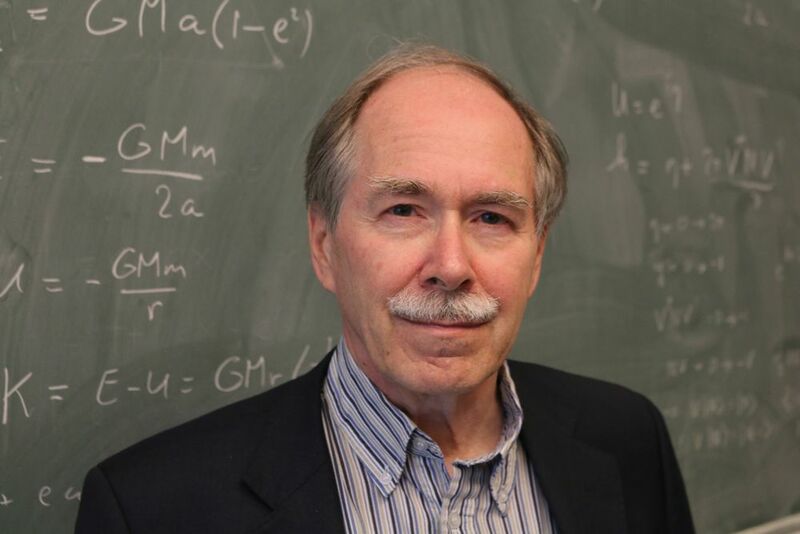 Gerard ‘t Hooft is one of my heros in physics. My other heros are Albert Einstein and Roger Penrose. Gerard ‘t Hooft is known for his brilliance and clarity of thought. All his papers are examples of clear thinking. He is also known for his patience and kindness. You should also know that Gerard ‘t Hooft is a Nobel laureate. He shared the Nobel Prize in Physics with Martinus J.G. Veltman in 1999 “for elucidating the quantum structure of electroweak interactions in physics.” You can get more information about his Nobel winning contributions to physics at the Nobel site. Like Albert Einstein Gerard ‘t Hooft has been uncomfortable with Quantum Mechanics. He has been working towards an alternative theory in the past decade. He summarized his work in a 207 page paper titled “The Cellular Automaton Interpretation of Quantum Mechanics: A View on the Quantum Nature of our Universe, Compulsory or Impossible” which was published in 2014 but I became aware of it recently. I will refer to this paper as the “CAI paper” in the remainder of this post. The “CAI” stands for “Cellular Automaton Interpretation” of Quantum Mechanics. The premise of CAI is that at the tiniest scale the universe is deterministic which means that everything can be explained in principle by the initial conditions and a finite number of classical rules for behavior. He tries to prove that the quantum weirdness observed at larger scales – the scale where we observe particles and fields – can be explained by the loss of information. “Crazy-old-guy syndrome” does not apply to Gerard ‘t Hooft who is one of the most respected physicists in the world. His clarity of thought and his skill in the mathematical exposition of his ideas are unmatched. Even though I don’t agree with the premise of the CAI paper, out of my tremendous respect for Gerard ‘t Hooft I wanted to bring the CAI paper to your attention. “What exactly happened to the superposition principle in the CA Interpretation of quantum mechanics? Critics of our work brought forward that the CAI disallows superposition, while obviously the superposition principle is serving quite well as a solid back bone of quantum mechanics. Numerous experiments confirm that if we have two different states, also any superposition of these states can be realised. Although the reader should have understood by now how to answer this question, let us attempt to clarify the situation once again. our description of the Standard Model, or any other known physical system such as atoms and molecules, we do not use ontological states but templates, which can be regarded as superpositions of ontological states. The hydrogen atom is a template, all elementary particles we know about are templates, and this means that the wave function of the universe, which is an ontological state, must be a superposition of our templates. Which superposition? Well, we will encounter many different superpositions when doing repeated experiments. This explains why we were led to believe that all superpositions are always allowed. states. Such superpositions never occur. have been brainwashed with the notion that superpositions occur everywhere in quantum mechanics. At the same time we were told that if you try to superimpose classical states, you will get probabilistic distributions instead. It is here that our present theory is more accurate: if we knew the wave function of the universe exactly, we would find that it always evolves into one classical state only, without uncertainties and without superpositions. Of course this does not mean that standard quantum mechanics would be wrong. tiny distance scale in terms of evolution laws that process bits and bytes of information. but this we could not elaborate very far. there) qubits do not play any role, in contrast with more standard approaches considered in today’s literature. Hilbert space only enters when we wish to apply powerful mathematical machinery to address the question how these evolution laws generate large scale behaviour, possibly collective behaviour, of the data. that phenomena at the distance and energy scale of the Standard Model (which comprises distances vastly larger, and energies far smaller, than the Planck scale) can be captured by postulating the effectiveness of templates. Templates are elements of Hilbert space that form a basis that can be chosen in numbers of ways (particles, fields, entangled objects), which allow us to compute the collective behaviour of solutions to the evolution equations that do require the use of Hilbert space and linear operations in that space. The original observables, the beables, can all be expressed as superpositions of our templates. Which superpositions one should use, differs from place to place. This is weird but not inconceivable. Apparently there exists a powerful scheme of symmetry transformations allowing us to use the same templates under many different circumstances. The rule for transforming beables to templates and back is complex and not unambiguous; exactly how the rules are to be formulated, for all objects we know about in the universe, is not known or understood, but must be left for further research. beables, are elements of Hilbert space and require the well-known principles of superposition. The second element in our CAI is that objects we normally call classical, such as planets and people, but also the dials and all other detectable signals coming from measurement devices, can be directly derived from beables, without use of the templates. Of course, if we want to know how our measurement devices work, we use our templates, and this is the origin of the usual ‘measurement problem’. What is often portrayed as mysteries in quantum theory: the measurement problem, the ‘collapse of the wave function’, and Schrodinger’s cat, is completely clarified in the CAI. All wave functions that will ever occur in our world, may seem to be superpositions of our templates, but they are completely peaked, ‘collapsed’, as soon as we use the beable basis. Since classical devices are also peaked in the beable basis, their wave functions are collapsed. No violation of Schrodinger’s equation is required for that, on the contrary, the templates, and indirectly, also the beables, exactly obey the Schrodinger equation. Lecture course: Lie Groups in Physics: This lecture course was originally set up by M. Veltman, and subsequently modified and extended by Bernard de Wit and G. ‘t Hooft. This entry was posted in physics and tagged fundamental physics, Quantum mechanics. Bookmark the permalink.